Vodka is no longer king. Nothing against neutral grain spirits, but a lack of discernible flavor is not necessarily the only tool in the modern bartender’s speed rack, and thanks to resurgence of interest in classic cocktails, more consumers are seeking alternatives—and adjectives other than “smooth” to describe their favorite spirits. Equal to this renewed demand is whiskey, which is less a specific kind of spirit than a grouping of many spirits whose depth, complexity and versatility make them indispensable to both professional bartenders and amateur enthusiasts. The problem is that walking into the whiskey section of even a small liquor store can be a daunting experience without a basic working knowledge of the differences between whiskies and their application in cocktails. So to get you started, here’s a rundown of the four basic types of whiskeys. Keep in mind that there are exceptions to (most) every rule, and that whiskey is a broad and detailed subject with more than its share of academic minutia; however, this primer should be more than enough to help you navigate the pitfalls of the whiskey aisle. America’s National Spirit (Congress said so in 1964), bourbon is distilled from at least 51% corn (most are at least 70%) and aged only in new, charred oak barrels for a minimum of two years. Other countries may manufacture whiskey with a similar mash, but as is the case with France and Champagne in the world of wine, bourbon is made only in the United States and is so named for its strong association with Bourbon County in Kentucky. Tennessee whiskey, while produced in the same manner as bourbon, is differentiated by a stage of filtration called the Lincoln County Process, where the whiskey is passed through a layer of sugar maple charcoal before it is aged. Bourbon generally exhibits a sweeter flavor profile than rye whiskey and its drier European counterparts. Strong notes of vanilla, oak, leather, dark fruit and honey are typical. Classic cocktails that utilize bourbon as a primary ingredient include the Old Fashioned, Mint Julep, and the Eastern Sour. To be called an American rye (Canadian rules are a bit more lax), the mash must be at least 51% rye, and like bourbon, it must be aged for two years in new, charred oak barrels. Once equal to bourbon in popularity before Prohibition, rye is currently enjoying something of a Renaissance, thanks to renewed interest in classic cocktails and its spicy, often fruity flavors. An essential ingredient in legendary cocktails like the Sazerac, Manhattan and Algonquin, rye also functions as a secondary grain in the mash of well-known bourbons like Buffalo Trace and Bulleit. The subject of classifications and regional distinctions in Scotch is certainly worthy of a separate (and lengthy) article, but for introductory purposes, there are basically two kinds of Scotch whisky: single malt and single grain. Single malt Scotch is made only from malted barley and water; single grain Scotch is made at only one distillery, but contrary to its name, it may be made from more than one grain (and often is). 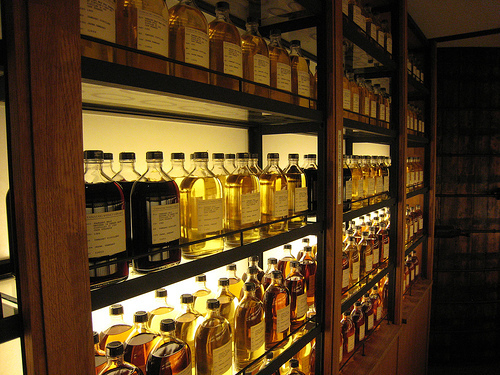 All Scotch, however, must be made primarily from malted barley. Blended Scotch whisky may be made from numerous percentages of single malt and single grain whiskies. Often, peat is added during the malting process to impart smoky and earthy flavors and aromas. One of the world’s great spirits, single malt Scotch is enjoyed by enthusiasts worldwide, but is not used often in cocktails. The reasons for this are varied and debatable, but the singular and often aggressive flavor profiles of many Scotch whiskies make it more difficult to integrate successfully into a cocktail. There are a few incredible drinks that utilize blended Scotch, such as the Blood & Sand, Rob Roy and Rusty Nail. Compared to Scotch whisky, the regulations governing Irish whisky are simple: Irish whiskey must be made from yeast-fermented malted grain, it must be aged at least three years, and it must come from Ireland. When the finished product comes from more than one distillate—that is, whiskey from different runs through the still, or different distilleries—it is referred to as blended Irish whiskey. Irish whiskey is typically lighter in body and less smoky than Scotch whisky, with a drier finish. Like Scotch whisky, however, Irish whiskey is frequently imbibed straight and tends to be underrepresented in cocktails, apart from some vintage gems like Cameron’s Kick. As a final note, I know that new whiskey drinkers are often confused by the use of “whiskey” versus “whisky.” There is no firm rule about when the “e” is used, but it is customary to omit it when discussing whiskies from Scotland and Canada. American and Irish whiskies generally preserve the “e,” but that is largely a matter of preference and regional custom rather than a requirement. Whiskeys are a vast market, and their varied personalities and applications are quite compelling, especially in cocktails. Bartenders are using Scotch and Irish whiskies more and more in cocktails, and there is no question that a single bottle of bourbon in a bar is indispensable for its versatility. But all whiskies have unique personalities, and it’s definitely worthwhile to become acquainted with each of them. Marleigh Riggins Miller is writer, photographer and publisher of SLOSHED! Begun in early 2005, the focus of SLOSHED! is on cocktails—good, bad and indifferent—with a definite bias toward the classics, homemade ingredients and entertaining. Marleigh is BarSmarts Certified and is a member of the Cocktails & Spirits Online Writers Group. When not writing or shooting photos for SLOSHED!, she works as a graphic designer and design instructor, gardens and favors cold Belgian-style ales.